Surfing is far from the only thing that will get your heart pumping in San Diego. Did you know you can jump from an airplane, swim with sharks, and hit 50 miles per hour on a boat? Yep—and all on the same day if you please. These adrenaline-laced activities will give you a taste of San Diego that will make your palms sweat. SeaWorld’s newest electric eel doesn’t bite. But it does accelerate to a top speed of 62 miles per hour and reach a height of 150 feet in its one-minute ride packed with rolls and twisting loops. 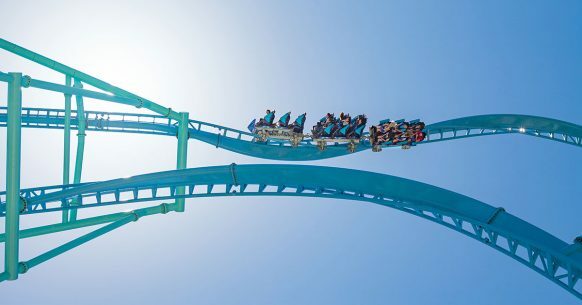 Oh yeah, that’s because this electric eel is the tallest and fastest roller coaster in San Diego. Opened in May, it offers the only upside-down view of Mission Bay. Step inside iFly’s 50-foot wind tunnel and you’ll see why so many people fall for the experience: a simulated skydive—two minutes in length, three times longer than typical skydives—in artificial 120 mile-per-hour winds. It’s not just a rush either; flying is a full-body workout. Flights start at about $80 per person for two flights. What better way to experience the hilly landscape home to the La Jolla Band of Luiseño Indians than screaming along on a zip line? You can tour the Indian reservation—at up to 55 miles per hour, for a length of a half-mile—with the two-hour, four zipline course for $99 per person. San Diego is home to some excellent indoor rock climbing gyms, including Mesa Rim, with its impressively tall top-rope and lead climbing walls, and the Grotto, a boulderer’s paradise of short, steep walls. It’s also home to some excellent rock right inside the city limits in Mission Trails Regional Park. Let a guide service like Chillino Rock Climbing show you the ropes. Southern California’s only coastal skydiving service takes in the entire San Diego coastline. Just a mile from the beach in Oceanside, tandem jumpers take the plunge from 13,000 feet with GoJump Oceanside. SkyDive San Diego will take you 13,000 feet above the desert landscape of Jamul, where a five-to-six minute plunge with views of Mexico ends on a grassy drop zone near waiting friends and family. Ever wanted to see a shark up close? San Diego-based Shark Diver will do you one better and take you on a five-day great white shark diving adventure to Mexico’s Isla Guadalupe. Not for the faint of heart, this bucket list experience is open to all ages and skill levels. San Diego Bay is large and full of things to see. That’s why you may want to get a tour in a 1,400 horsepower boat capable of hitting 50 miles per hour. Flagship’s Patriot Jet Boat’s 70-foot crafts do just that. Yes, some of the bay’s sights might be a tad blurry while doing 360-degree turns as music cranks from its speakers and passengers get soaked with spray, but you’ll probably be having too much fun to mind. This entry was posted in Attractions and tagged county, outdoor recreation by San Diego Magazine. Bookmark the permalink.